IdlePaws, Inc. is based out of the Syracuse, NY area. National pet treat safety scares prompted us, Sue and Jim, to develop healthier options for snack time for our dogs. After countless hours of research, speaking to local vets, and kitchen time our all natural recipes became quite popular with friends, family and the local community. This led to the formation of IdlePaws Inc in 2008 so we could bring our to the rest of the world - and we are honored this journey has led you to here. Overtime, we have honed our recipes with your help. This has led us to developing what we think is the tastiest, best variety of healthy snacks available. 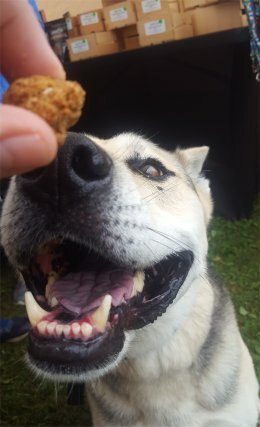 We make our treats for our pets, and they love them. We know yours will as well - even the picky ones. We use no wheat, corn or soy in our dog treats. and offer a wide range of recipes including corn, gluten and grain free options. All of our recipes are proudly made in the USA with all natural ingredients in order to meet the toughest taste standards of even the most finicky pets. Our recipes have no wheat, grain or soy. We also have grain free and gluten free options as well. If you live in the Syracuse, Buffalo, Glens Falls Utica / Rome areas You can find our cookies in a number of the finer health food stores and dog day cares. If you have a favorite store and would like to see us there, please drop us a line and we'll do our best to get on the shelves. Otherwise we are have to ship anywhere in the USA.